Gert, ZS6AYU plans holiday-style activity as Z21GF from near Victoria Falls, Zimbabwe between May 19-23, 2014. 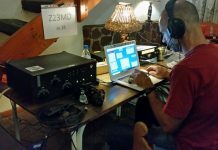 QRV on 40-10m, CW. Possibly 6m.